Developed for wide deployment in the world’s most demanding enterprise, access, and service provider aggregation networks, Cisco IOS Software Release 15 M and T provides a comprehensive portfolio of Cisco technologies, including the leading-edge functionality and hardware support from Releases 12.4 and 12.4T. Release 15 M and T key innovations span multiple technology areas, including Security, Voice, High Availability, IP Routing and Multicast, Quality of Service (QoS), IP Mobility, Multiprotocol Label Switching (MPLS), VPNs, and Embedded Management. 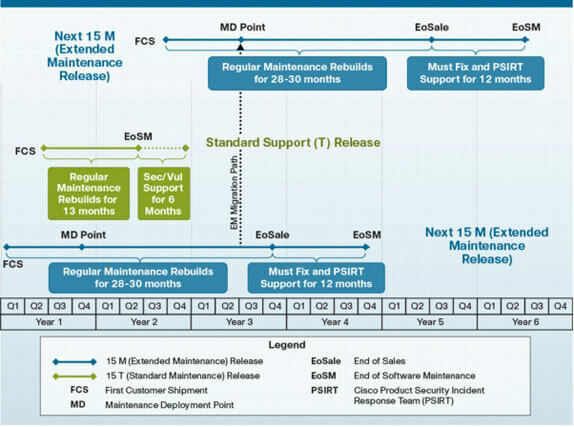 Release 15 M and T provides customers new feature release delivery and hardware support in a shorter amount of time, broadened feature consistency, more reliable new feature release and rebuild schedules, proactive release support lifecycle policies, and easier software selection, deployment, and migration guidelines. 15 M (Extended Maintenance) releases delivered on a more frequent basis (approximately every 16 months), enabling customers to qualify, deploy, and remain on a release longer with active support. Release 15.0(1)M (FCS November, 2009) is the first 15 M release. 15 T (Standard Maintenance) releases (in between 15 M releases) ideal for the very latest features and hardware support before the next 15 M release becomes available. Each 15 T release receives bug-fix rebuild support for 13 months, plus an additional 6 months support for security/vulnerability issues such as Product Security Incident Response Team (PSIRT) advisories. Release 15.1(1)T (FCS March, 2010) is the first 15 T release. Developed for wide deployment in the world's most demanding enterprise, access, and service provider aggregation networks, Cisco IOS Software Release 15 M and T provides a comprehensive portfolio of Cisco technologies, including the leading-edge functionality and hardware support from Releases 12.4 and 12.4T.